Buildex®. One of the worlds leading manufacturers and suppliers of self-drilling screws and fasteners. One of the world's leading manufacturers and suppliers of self-drilling screws and fasteners. Tapcon fixes directly into pre-drilled holes in concrete and brick, as well as pre-cast panels, lightweight cement blocks, without inserts or chemicals. Fast installation: drill a hole and drive an anchor. Can be installed close to the edge of concrete. Thread design results in increased pullout values and lower installation torques. 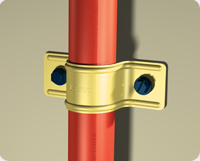 Climaseal® coating provides extra corrosion resistance. Recommended for use in ACQ pressure-treated lumber. Using a hammer drill, drill a hole 1/4” deeper than anchor embedment. position Tapcon concrete anchor onto tool. Drive Tapcon anchor into pre-drilled hole until anchor is fully seated. eg. brackets, window frames, light fittings, timber. * All TAPCON boxes of 100 come complete with the required TAPCON drill bit. eg. signs, fences, hose reels. Minimum order quantities do apply.